Fusarium Keratitis is a relatively rare but serious corneal infection caused by a fungal organism normally found in organic matter such as soil and many plants. The infection cannot be transmitted from person to person. Symptoms can include pain and eye redness, blurred vision, sensitivity to light, increased tearing, eye discharge, and/or a white filmy patch in the cornea. If not quickly diagnosed and treated with topical and/or oral anti-fungal medications, the infections can cause scarring and ulceration of the cornea and resulting vision loss or blindness. About one-third of consumers who suffered from Fusarium Keratitis following the use of the ReNu with Moisture Loc product have required corneal transplants. Bausch & Lomb is culpable in at least two significant ways. First, it is now clear that its ReNu with MoistureLoc product is defective because it fails to adequately sterilize contact lens of the fungal organism responsible for Fusarium Keratitis under foreseeable circumstances. The company has conceded that the unique formulation of ReNu with MoistureLoc can create biofilms that sometimes shield the Fusarium fungus from the sterilizing agent in the product. This in turn can allow the Fusarium organism to colonize in a lens case or bottle cap. This defect was not discovered until after the product began to be sold because Bausch & Lomb failed to conduct sufficient pre-market tests. Second, and more importantly, Bausch & Lomb became aware that its product was associated with a greatly increased risk of Fusarium fungal infections many months before it took meaningful steps to warn or protect the consuming public in the United States. In February 2006, Bausch & Lomb halted the sale of ReNu with MoistureLoc in Asia because of various reports it had received, beginning as early as October 2005, about clusters of Fusarium eye infections which had been linked to the use of that product. Despite this evidence, Bausch & Lomb gave no warning to contact lens-wearers in the U.S., and it continued to market and sell ReNu with MoistureLoc in this country. In March 2006, the U.S. Centers for Disease Control and Prevention (CDC) advised that it had received reports of a significant increase in the incidence of Fusarium Keratitis among users of soft contact lenses. In a report dated April 10, 2006, entitled “Fusarium Keratitis – Multiple States, 2006,” The CDC discussed its investigation of 109 cases of suspected Fusarium Keratitis in 17 different states, including Georgia. That report indicated there was a strong association between this outbreak of Fusarium infections and use of the ReNu with MoistureLoc product. As a result, that same day, April 10, 2006, the CDC and U.S. Food & Drug Administration (FDA) issued a joint warning to the American public about the association between the use of contact lens care solutions and the Fusarium outbreak. The joint statement specifically announced that “in a fairly dramatic fashion the highest association currently is with the ReNu with MoistureLoc.” Three days later, on April 13, 2006, Bausch & Lomb finally announced that it was temporarily suspending shipments of ReNu with MoistureLoc to U.S. retailers and suggested that contact lens wearers switch to a different contact lens care solution until the company’s investigation was concluded. The following day, May 16, 2006, the FDA submitted a report to Bausch & Lomb in which it stated that the company had delayed for weeks telling regulators about reports linking its contact lens solution to cases of Fusarium eye infection. The FDA report, released on the agency’s website, also identified more than a dozen potential manufacturing violations, including failure to follow procedures to prevent contamination at the company’s Greeneville, South Carolina plant where ReNu with MoistureLoc was produced. In August 2006, the Journal of the American Medical Association published the results of the CDC’s investigation which had been prompted by reports of a possible Fusarium outbreak in February and March 2006. The August 2006 edition of JAMA revealed that the CDC investigation had established a conclusive link between the 2005-2006 outbreak of Fusarium Keratitis in the U.S. and use of Baush & Lomb’s ReNu with MoistureLoc product. The report also repudiated Bausch & Lomb’s unsubstantiated claim that the Fusarium infections were the result of consumers’ failure to properly clean their lenses and regularly replace the storage solution. Instead, the CDC concluded that defects in the product were the sole culprit, and that users of ReNu with MoistureLoc were 20 times more likely to develop Fusarium Keratitis compared to those using other contact care solutions. This evidence establishes two facts. First, Bausch & Lomb’s ReNu with MoistureLoc product is unsafe and is associated with a much higher incidence of Fusarium Keratitis. Second, Bausch & Lomb was well aware of the serious adverse health consequences associated with the use of its ReNu with MoistureLoc product. 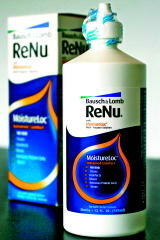 Notwithstanding its awareness of the danger, Bausch & Lomb continued to produce, promote and sell its ReNu with MoistureLoc product until mid-May 2006. As a result, more than 100 contact lens wearers have suffered significant injury to their eyes. Daniel Ragland is a products liability trial attorney with the Atlanta law firm Ragland Law Firm, LLP. He has nearly 20 years of experience handling serious injury and wrongful cases involving dangerous drugs and unsafe medical devices. Mr. Ragland has handled product liability cases throughout all areas of Georgia and other states in the Southeast. He can be contacted at (770) 407-7300.